BWC fundraiser: screening of Sonita – 18 May! Sonita tells the remarkable, inspiring story of its namesake: a gutsy, defiant, 14-year- old Afghan refugee who fights to live the way she wants as an artist, musician and singer. This remarkable film is not on general release, but we have secured an exclusive screening at Cinema Nova. Funds raised from this special screening will help the choir. Watch the official trailer now. Be seated by 7pm to catch a special performance by the Brunswick Women’s Choir before the film. Tickets are only available online (not tickets at the door)! Sonita is 18-years- old, an undocumented Afghan illegal immigrant living in the poor suburbs of Tehran. She is a feisty, spirited, young woman who fights to live the way she wants, as an artist, singer, and musician in spite of all her obstacles she confronts in Iran and her conservative patriarchal family. In harsh contrast to her goal is the plan of her family – strongly advanced by her mother – to make her a bride and sell her to a new family. The price right now is about US$9.000. The main storyline of the film builds around Sonita’s struggle to escape a forced marriage. She fights with the dilemma of not losing her family, but still be able to build a life of her own. In order to do so, she needs to obtain resident status, and to record and make video clips for her songs on a miniscule budget. Through this, we witness her family and their dilemmas and get to know her friends and colleagues who are also child laborers in the NGO “House of Affection”. Will Sonita be forced into marriage? Will she succeed in recording her songs? Will her family manage to take her back to Afghanistan? 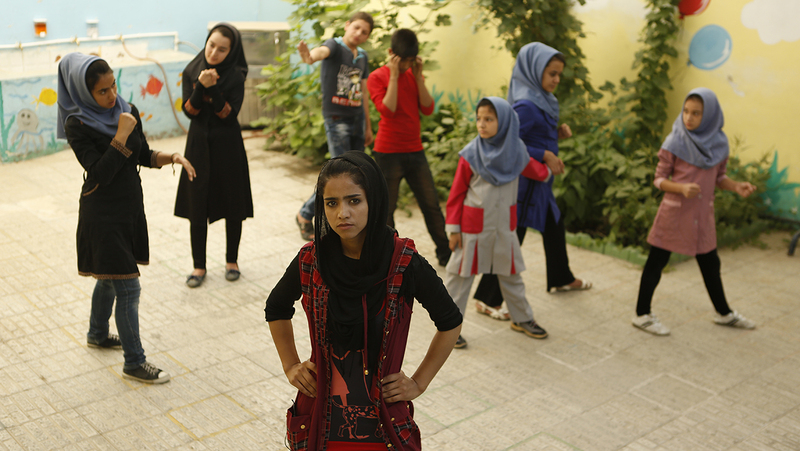 The film unfolds in Sonita’s home, at the NGO and in music studios in and around Teheran. Later we will need to travel to her hometown in Afghanistan. If you missed our CD launch last weekend or you’d like to hear it all again, we’ll be showcasing the songs from our new CD ‘Sing Anyway’ at the Darebin Music Feast at 8pm on Friday 5 October. Join us for an evening of beautiful music and songs from local and overseas artists such as Dave Steele, Jennie Swain, Joe Geia, Tony Backhouse, Sweet Honey in the Rock and Indigo Girls. Wine, women and song! On Sunday 12th February, Brunswick Women’s Choir will be performing its first concert for 2012 in the glorious chapel at Stones of the Yarra Valley Winery. Rising from the rustic, weather-beaten remnants of a century-old barn, Stones of the Yarra Valley has emerged as the Yarra Valley’s premier location for celebration and performance. We would love you to join us! Guests may wish to dine afterwards* at the winery, combining a restaurant and mezze bar with a stunning rough-rendered chapel nestled under century-old oak trees. Book Now with debit/credit card. ﻿﻿﻿*Lunch is not included in ticket price. For more information and menus got to the Stones of Yarra Valley website. Brunswick Women’s Choir is heading for the hills! Why not leap into spring with some singing in the country air! As part of this year’s Mansfield Spring Arts Festival, Brunswick Women’s Choir will be running a 2-hour singing workshop and performing an evening show at The Mansfield Produce Store. Booking details are below. Mark this in your diary now! The Brunswick Women’s Choir is planning a fabulous party to celebrate 20 wonderful years of singing and at 6pm on Saturday 13th August the Brunswick Town Hall is where you will want to be. This will be a night of song and memories, wining and dining, hilarity and dancing. We have hired the delicious talents of Seven Stars for your gastronomic delight, the choir will put together a birthday cake to end all birthday cakes, there’ll be songs from our 20 year herstory and The Junes will rock your socks off to finish the party with a bang. Otherwise, get that date in your diary now and stay posted as once those tickets go on sale they will sell like hot cakes! At 7pm on Tuesday 15th March the Victorian Womens Trust is hosting a very special event at the Welsh Church, 320 LaTrobe Street to celebrate International Women’s Day. The Brunswick Women’s Choir has been invited to open the event with songs that have given voice to many women over their 20 year history. This will be followed by the Muriel Matters Public Lecture. A tribute to a very respected feminist and activist delivered by Frances Bedford MP for Florey. It’s that time of year to wish all our friends a very happy festive season and plenty of great singing throughout! Our first gig for the New Year will be at the annual Daylesford Singers Festival which is being held at various venues in Daylesford on the weekend of the 14th to the 16th January. We will be participating in the Choirs Concert on Sunday 16th January at 2.30pm in the Daylesford Town Hall. Join us for a veritable a feast of singing with performances from all the wonderful choirs that will be at the festival. After a big year of touring – from Adelaide to Alice Springs, Coburg to Coober Pedy, Daylesford to Darwin – we are back in town! And we’re performing two concerts “At Home” on Saturday 23 October. Don’t miss these two concerts, our biggest for the year, showcasing our latest repertoire right at home in Brunswick.